The Asus ZenFone AR is one of the few smartphones that are part of Google's Project Tango. Launched on the market more than six months ago, the device is still priced at around $600 in the United States. 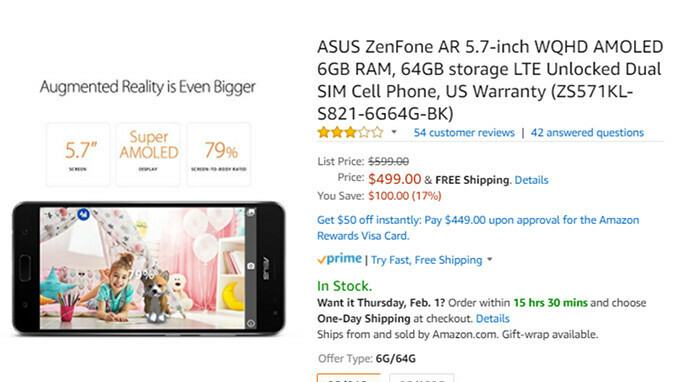 However, Amazon is currently running a sale on the Asus ZenFone AR, so those who want to try out this Project Tango device can now get it for $100 cheaper. The ZenFone AR features a tricam system with 23-megapixel rear-facing camera that offers 4K video recording, along with another 8-megapixel camera in the front. The hardware is a bit old, as Asus included a Snapdragon 821 processor, but there's plenty of memory inside – 6GB RAM and 64GB expandable storage (up to 2TB). Obviously, Asus ZenFone AR is fully compatible with Google Daydream VR, but you'll have to purchase it separately. Also, the device will not work on CDMA networks, so you'll only be able to use it with AT&T and T-Mobile in the US. It has a pretty good AMOLED display, and the SD 821 might be older in terms of when it was first released, but it's GPU is rated at around 520 gigaflops. The SD 835 is rated at 580 gigaflops. Not much higher than the 821.